As those in the industry know, a building isn’t finished until it’s certified. But not everyone can certify your work. 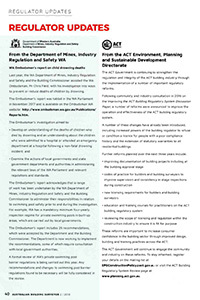 The ACT Government is continuing to strengthen the regulation and integrity of the ACT building industry through the implementation of a number of important regulatory reforms. It’s time to take the Housing Choices conversation to the next level. 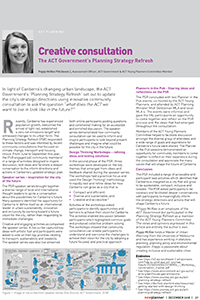 When we engage, collaborate and demonstrate – what can we achieve? Whoever thought it could be so complicated to plan a city the size and age of Canberra? 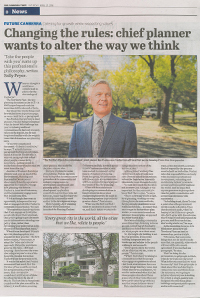 The Territory Plan – the key planning document in the ACT– is 2000 pages long and contains more than 1400 rules and criteria. But what if the whole thing could be whittled down to just one page, or even – wait for it – a paragraph? As we transition through life, change is inevitable. However, one element remains and that is the need for a place to live. 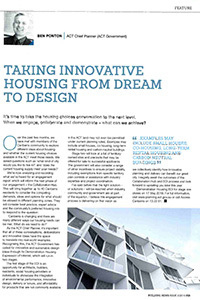 Change sees our life needs shift and with that, our housing needs can also differ through the many phases of our lives. 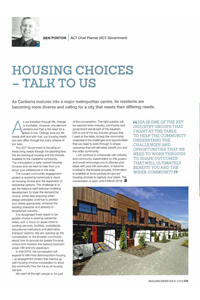 Earlier this month, the ACT Government announced the Housing Choices discussion paper to start a conversation about housing types. The government is keen to broaden the mix of housing in the Territory, in a way that respects the characteristics of neighbourhoods that attract residents in the first place; this is in response to what we heard during the development of the Minister’s Statement of Planning Intent.